Myth-busting isn’t just for television. And through a multi-faceted, tech-savvy campaign based on strategic partnerships, one federal office has found a winning strategy for combating misinformation. National Drug Facts Week (NDFW) is a health awareness week for teenagers, with the goal of debunking myths about drugs. The National Institute on Drug Abuse (NIDA), part of the National Institutes of Health, organizes the week and reaches teens in a relevant, engaging way. This year, 1,557 NDFW events were held across the U.S. and internationally. NIDA works with federal, state and local partners to implement NDFW. To reach today’s teens, digital outreach is at the center of it all. The signature NDFW event is Drug Facts Chat Day, a live Web chat linking high schools and NIDA scientists. Students from across the country can ask questions about drugs and drug addiction, and scientists provide fact-based responses. This year’s Chat Day took place on January 30th. During the event, moderators direct questions to specific scientists and science writers, who provide the answers. Each of the approximately 50 scientist experts is paired with an editor, who cleans up the answer, adds links, and posts it. Although Chat Day has been running for several years, the NIDA organizing team always looks for ways to fine tune their efforts. A feed of Chat Day was available to interested participants who could not be a part of the chat. Smith also worked with a team to provide content via NIDA’s Twitter, @NIDAnews. Common questions were put into a template with stock photos. Each question was written as a tweet and the answer was given as an image, in order to incorporate extra text. 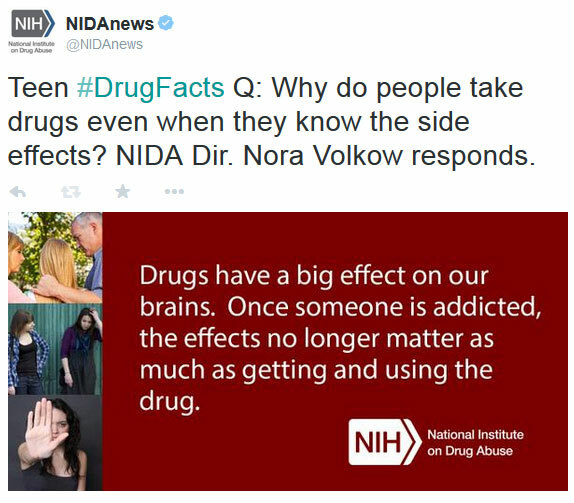 The NIDA team also posted a NDFW video on Vine featuring the NIDA Director, Dr. Nora Volkow, on Chat Day. Brian Marquis, Public Liaison Officer for NIDA, said that the organizing team limits registration to approximately 130 schools, due to demand. On average, 50 to 60% of the registered schools log on, and this year, 72 schools participated. NIDA aims to answer 30% of the teens’ questions. Another part of the digital evolution of NDFW was the creation of the National Drug IQ Challenge quiz. Video elements were added to the quiz three years ago. This year marks the second time NIDA was able to create the interactive IQ quiz in Spanish, and for the first time, Spanish video segments were included in the Spanish version of the quiz. As of February 9th, 38,000 people had visited the quiz site (since January 1st). However, the number of people who have taken the quiz is likely much higher: Linton said many event holders display the quiz on a large screen and make the quiz a group effort. The quiz is also available for download in PDF format in both English (PDF, 4 pages, 3 MB, September 2014) and Spanish (PDF, 4 pages, 2MB, September 2014). Download statistics are not included in the site visits statistic. NIDA also takes an adaptive content approach to the online quiz: if teens don’t do well, they will get a list of additional resources relating to their score. High scorers also receive resources, but a different set. Building connections is the foundation of NIDA’s efforts for NDFW. Community and school events are locally planned: school assemblies, after school clubs, athletic events, and juvenile justice organizations are just a sampling of locations where events take place. One example of a partner event is Mentor Foundation USA’s Shattering the Myths: over 200 high school students attended this year’s event on January 29th. Students posed questions during a Q&A with a NIDA scientist, participated in slam poetry workshops, and heard from guest speakers, including parents who lost their teenage son to one hit of a synthetic drug called Spice. Highlighting past years’ successes also helps the NIDA team build partnerships: when people see the success of past events, they often want to organize their own, Marquis said. The NIDA for Teens website is the main hub of activity during NDFW. Teens and organizations can find online toolkits with suggestions on how to plan, promote, and host events, find expert facilitators, and order free materials. The website also has a “What’s New and Cool” section, featuring tweets, blogs, newsletters, and any other type of media that promotes NDFW. This year, Dr. Phil and Dr. Oz distributed NDFW content via social media. Dr. Oz and The Dr. Phil Show tweeted about NDFW, and Dr. Phil had a promotional box on his website that took people to the IQ Challenge quiz. Other partners used social media to reach teens: the National Association of County and City Health Officials (NACCHO) partnered with Students Against Destructive Decisions (SADD) to host an hour-long Twitter chat on January 29th from the @NACCHOalerts account using the hashtag #NDFW. “Collaboration with social media partners and an emphasis on creating and sharing highly visual content were key to our success on social media during NDFW,” said Smith.Each year, NDFW is powered by six people within NIDA’s Public Information and Liaison Branch, in addition to their normal duties. If you would to know more about NDFW, please contact Sara (Crocoll) Smith.